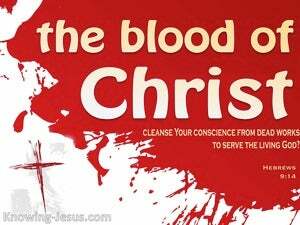 ﻿ Hebrews 9:14 how much more will the blood of Christ, who through the eternal Spirit offered Himself without blemish to God, cleanse your conscience from dead works to serve the living God? how much more will the blood of the Messiah, who through the eternal Spirit offered Himself without blemish to God, cleanse our consciences from dead works to serve the living God? how much more the blood of Christ, who, through the eternal Spirit, offered himself unblemished to God, will cleanse your conscience from dead works in order to serve a living God? how much more will the blood of Christ, who through the eternal Holy Spirit [or, His eternal Spirit] offered Himself without [moral] blemish to God, cleanse our consciences from deeds which lead to [spiritual] death to serve the living God? how much more will the blood of the Christ, who, through the eternal Spirit, offered himself without spot to God, cleanse your conscience from dead works, in order that you may serve the living God? how much more shall the blood of Christ, who through the holy spirit offered himself a spotless victim to God, purify our souls from deadly sins, to serve the living God? how much rather shall the blood of the Christ, who by the eternal Spirit offered himself spotless to God, purify your conscience from dead works to worship the living God? how much more shall the blood of Christ, who through the eternal Spirit offered up himself without spot to God, purify our conscience from dead works to serve the living God? how much more surely will the blood of the Christ, who with the eternal Spirit made himself an unblemished offering to God, purify our consciences from the old wrongdoing for the worship of the everliving God? How much more shall the blood of Christ, who through the eternal Spirit offered himself without spot to God, purge our conscience from dead works, to serve the living God? How much more shall the blood of Christ, who by the eternal Spirit offered himself blameless to God, purify your consciousness from dead works to serve the living God? 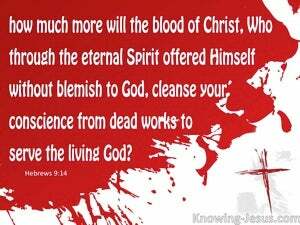 how much more will the blood of Christ, who through the eternal Spirit offered himself without blemish to God, cleanse our consciences from dead works to serve [the] living God? how much more shall the blood of Christ (who through the eternal Spirit offered Himself without spot to God) purge your conscience from dead works to serve the living God? How much more shall the blood of Christ - which through the eternal spirit, offered himself without spot to God - purge your consciences from dead works, for to serve the living God? how much more shall the blood of Christ, who in the spirit of the eternal offered himself as an unblemished sacrifice to God, cleanse your conscience from dead works to serve a living God? how much more shall the blood of Christ, who through his eternal spirit offered himself free from blemish to God, cleanse your conscience from dead works unto the service of an ever-living God! how much more will the blood of Christ, who through the eternal Spirit offered himself without blemish to God, purify our consciences from dead works to worship the living God. how much more will the blood of Christ, who through the eternal Spirit offered himself without blemish to God, cleanse our conscience from dead works to serve the living God? how much more shall the blood of Christ, who with an eternal spirit offered himself without fault to God, purify your conscience from dead works to serve the living God. How much rather shall the blood of the Christ, who through an age-abiding spirit offered himself unspotted unto God, purify our conscience from dead works, to the rendering of divine-service, unto a Living God? how much more shall the blood of Christ, who, by the eternal Spirit, offered up himself in sacrifice without blemish to God, cleanse our conscience from dead works, that we may perform divine service to the living God? 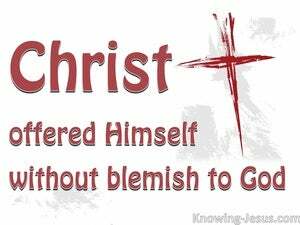 how much more will the blood of the Christ, who, through his eternal Spirit, offered himself up to God, as a victim without blemish, purify our consciences from a lifeless formality, and fit us for the service of the Living God! how much more surely will the blood of Christ, who with an eternal Spirit gave Himself a spotless offering to God, purify your consciences from works that mean mere death, to serve the ever living God? how much more shall the blood of Christ, Who through the Eternal Spirit offered Himself without blemish to God, cleanse your conscience from dead works to serve the living God? 'Whatever has a defect, you shall not offer, for it will not be accepted for you. "You shall say to them, 'This is the offering by fire which you shall offer to the LORD: two male lambs one year old without defect as a continual burnt offering every day. "Incline Your ear, O LORD, and hear; open Your eyes, O LORD, and see; and listen to the words of Sennacherib, which he has sent to reproach the living God.